Everyone wants to achieve success in life. But to guide through the ups and downs, it requires strategy, philosophy and goal-oriented work. It is important to understand the balance of emotions, mental and physical health and value of relationships. These aspects rule the path of success. The Happionaire book series deal with these issues. In recent times, it has become quite a phenomenon, touching the lives of thousands. 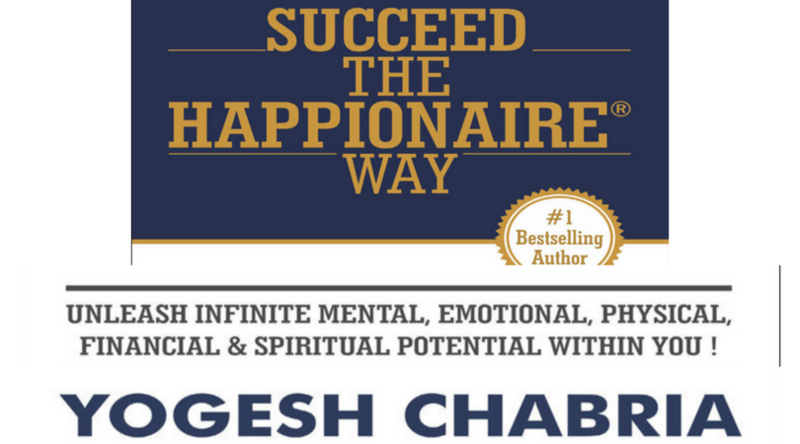 Written by acclaimed author Yogesh Chabria, “Succeed The Happionaire Way” is a spell-bounding masterpiece which emphasis on how to achieve success by focusing on significant aspects of our lives and what choices one should make to change one’s lifestyle and the path to achieve success. He is a bestselling author as well as a speaker and well-known entrepreneur who started his business in the mere age of 5 by selling toys and came out with his own IPO at age 12. This book delves into his experience with business landscape and how it moulded and motivated him to achieve success and pass on his knowledge to other people aspiring to do the same. This book inspires the reader to discover essential work principles and strategies to convert and realize their dreams and discover the true inner goals. It provides a mechanism to take action to overcome fear and attain an ultimate state of self-motivation and awareness. It talks about the power of relationships which plays a key role in the social growth of a person. At a personal level, it highlights the importance of physical, mental and emotional health along with meditation and sharing. It guides you through the process to achieve what is destined for you while focusing on rather simple facts of life. 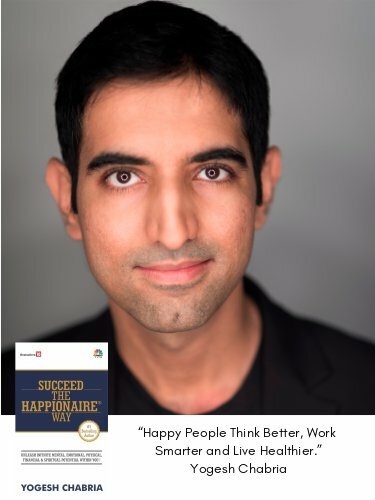 “Succeed The Happionaire Way” is a phenomenal book which reveals the success practices and principles followed by some of the most successful people of the world in a simple and easy to follow program while remaining nonchalant. The reader can benefit from various innovative strategies and universal principles mentioned in this book to achieve the desired goal. As aptly put by Chabria, a person’s knowledge can’t be stolen by anyone. It cannot be divided among peers or relatives. It doesn’t cause any load and increases every time it is spent. The wealth of knowledge is the greatest gift one can have to achieve greatness and success. This book talks about the importance of being innovative and teaches the reader about the real value to start with. Everyone experiences new things in life, and it is by sharing one can achieve success by learning from others. As mentioned earlier, it draws inspiration and quotes the qualities of the greatest leaders of our modern times. It inspires people to make a strategic approach to achieve goals and maintain the pace throughout the path to success. Chabria talks about the necessity of having a goal and how one should work towards it with all his passion and how one should dedicate to achieve it and not rest until he does that. He plays special emphasis on not settling for a lesser goal. He stresses on the fact that no goal is impossible and it can be achieved if one truly dream about it and work to achieve it. He also tells the reader to avoid people who tell that something is not possible. Another key aspect of his book entails the important trait of one should have, i.e. doing what he loves and love what he does, irrespective of if it is business, career or life. Remain in love with what one does and never listen to anyone who discourages from the path and goal. It is equally rewarding, as it first creates and then grows it. In his book, he stresses on the fact that if a person is happy doing anything at any level whether it is personal, mental, physical, emotional, financial or even spiritual, then that person will certainly attain success. He emphasizes on the fact that with complete peace of mind and overcoming doubt and lack of confidence, battling out fear, one can achieve greatness and become successful. Everyone has their own definition of success and following what you love with passion and happiness, one can achieve it. For entrepreneurs, he suggests that the biggest risk they are going to have on their journey is that they are going to have so much fun that they won’t even know how to handle it. He terms this as a great reward. This book highlights the importance of loving more, laughing more and playing more while going ahead with whatever one wants to do. And most importantly, follow the path one has chosen with complete passion with perseverance, confidence and without fear of failure. Ignore the negative people around and keep the focus on the goal. “Succeed The Happionaire Way” is a book which will definitely leave a great impact on you if you are looking for bringing real changes in your life and achieve your goals. It is brilliant masterpiece especially for those who are stressed out the way of their life. This book acts as a guide for the confused people who are struggling with finding the right course of preparing for the path to success. Yogesh Chabria provides many strategies in this book which is when taken into action allows the reader to take back the control of his life and also learn to enjoy it. Reading this book is a life-changing experience. It endorses the same philosophy with which people are grown with, seeing successful people achieve greatness but loses track over a period of time. It truly inspires you to make subtle and sometimes radical changes in the outlook and perspective a person should make to set a right course of the path to success. It provides high value and actionable ideas which helps you achieve your goals and takes you to next level. It transforms your life with its intricate details and concerning ideas about physical, mental and emotional well-being, the importance of spiritual guidance and its role. This book helps you unleash your potential and delimits your belief. Hostgator India Review – How to Install WordPress on Hostgator.in?